Ahh, back to school. Fresh haircuts, new backpacks, sharp outfits, and the sunniest smiles from our children. Most parents will beam with pride. Even more so for parents seeing their kids off to school for the first time. Back to school is a time for new beginnings and a great time for our little ones to start forming good eating habits. After all, teaching them to like good nutrition is a way to empower them for the rest of their lives! Better not wait until the New Year to make smarter decisions– now is the perfect time for kids to hit the reset button. New beginnings = new habits. “That’s great and all,” you say, “but back to school is a busy time for most.” After school activities, parent / teacher meetings, and homework. So. Much. Homework. If you’re a working parent, surely you’ve got homework of your own too! No wonder our kids end up with a bologna sandwich or a PB&J on one too many days… Most parents don’t have the luxury to make healthy, diverse lunches with fresh ingredients. Fortunately, there are solutions. 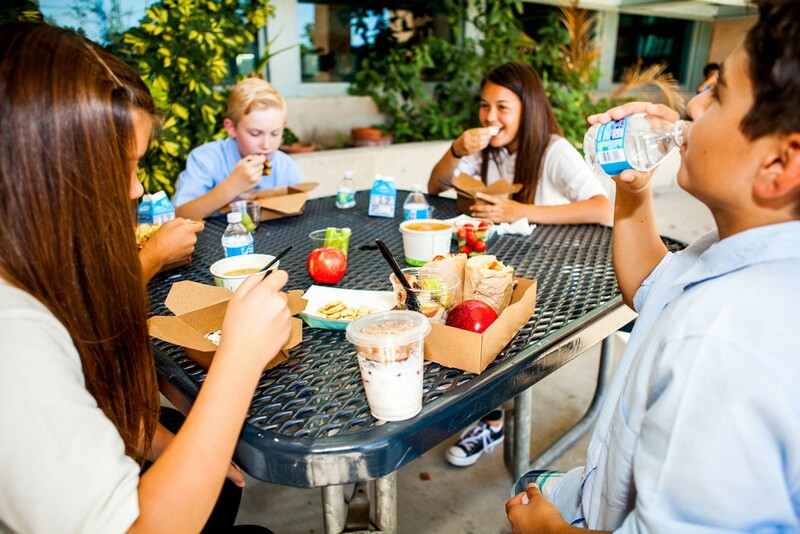 In Orange County, California, The Lunch MOB delivers to schools around the area. Kids from participating schools have access to delicious lunch entrees and healthier snack options perfect for after school programs. For lunch, students have a selection of yummy entrees like Spaghetti Squash and Meatballs, Crunchy Fish Soft Tacos, Mediterranean Flat Bread Pizza, and California Sushi Rolls. For the traditionalists, Mac and Cheese or Chicken Strips. Take a quick tour of our menu! If you live in Orange County and want healthier options for your kids, please help The Lunch MOB spread the word by requesting us at your kids’ schools. The Lunch MOB was founded in Irvine, California by a mechanical engineer and a 6th-grade math and science teacher– parents who genuinely wanted to help other parents. Learn more about Jonathan and Aileen here.